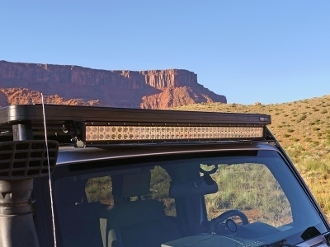 Mounts underneath the front or rear of a Front Runner Roof Rack. Comes standard with powder coated stainless steel Slimline II Roof Rack mounting brackets. (Optional original Slimline roof rack brackets are available(RRAC053). The light guard cover can serve as a barn door to control light fall off and help prevent light glare on the vehicle's hood/bonnet. NOTE: Minimum of 90mm (3.54 inches) clearance needed between the bottom of the Front Runner Rack and the vehicle's roof in order to fit this product.